I may be the last person on earth to have the hood release cable break. I searched the forums for about 45 minutes to formulate a plan. Since this is often an anxiety filled situation, if it's happening for the first time, I thought I'd try to post a 'How to'. Maybe it will help the next person. 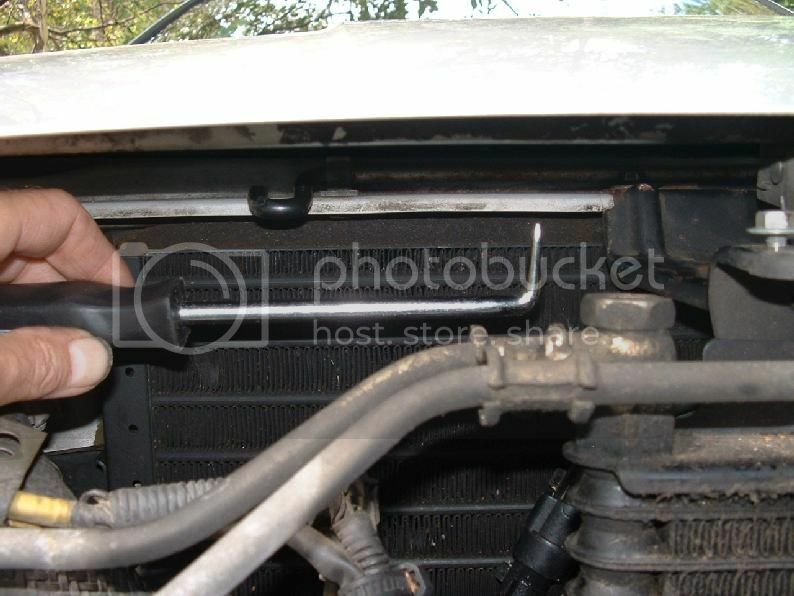 The first method is to access the latch from underneath the car with a long screwdriver, rod or pry bar. This picture shows where everything is, in case you forgot. The latch point is bout 3 1/2" in and 1" forward as shown. This is the underside of the latch. The point of the red arrow is the location and direction you need to push. It's a lot dirtier than the nice looking one in one of the other links but may be more what yours looks like. Keep in mind, this is upside down so everything is reversed. If you still have your A/C these parts will be in the way, making things more difficult. 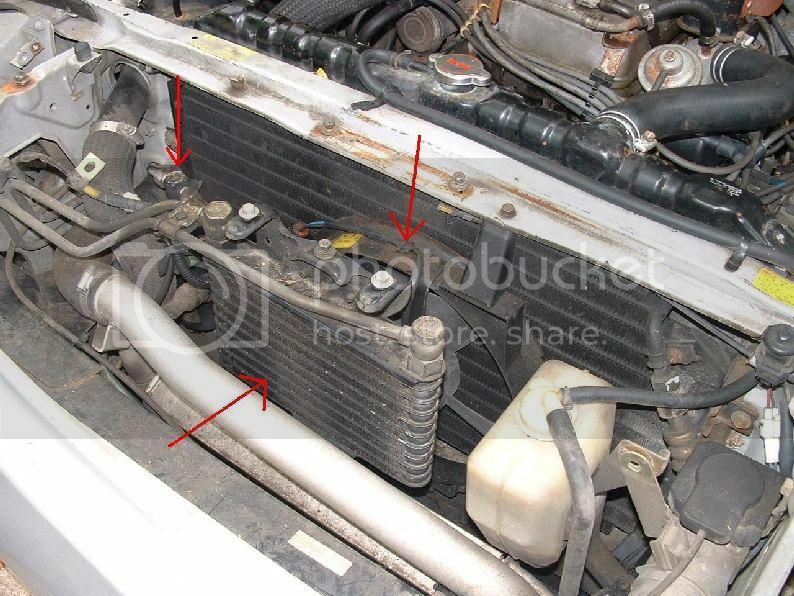 If you don't have these parts, remove the air diverter/splash guard underneath the front of the car, between the front air dam and the radiator. 10mm socket, 5 bolts, 3 nuts. With the air diverter/splash guard removed use your screwdriver/prybar/long rod to reach up and push the latch to the driver's side. It might be helpful to take the grill out if you have a helper to help guide the tool. 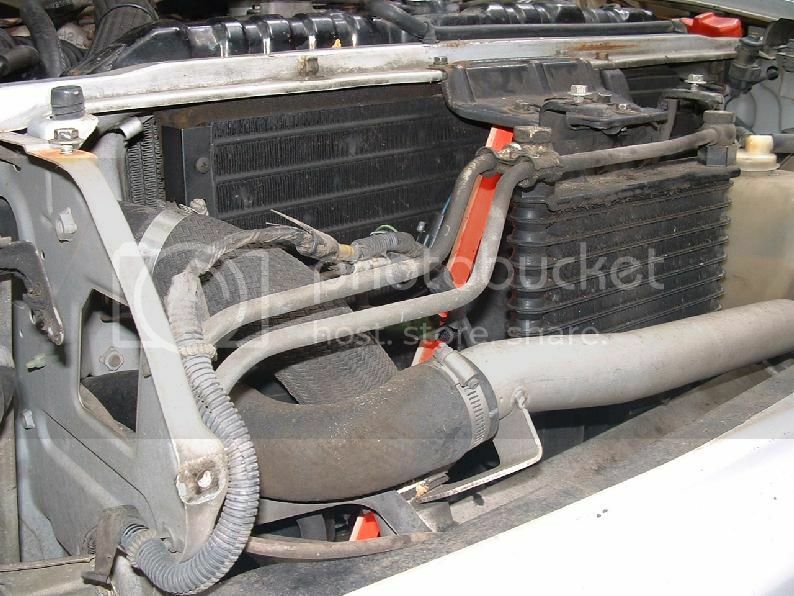 One of the intercooler pipes is in the way but it might help. There are 2 phillips head screws, one on each end, and 5 clips that hold the grill on. The clips are along the top of the grill. They often break but you may be able to lessen the breakage by pulling straight out from the top. You can order new clips and hood release cable here: http://www.enginemac...m/conquest.html - about 4/5 of the way down. 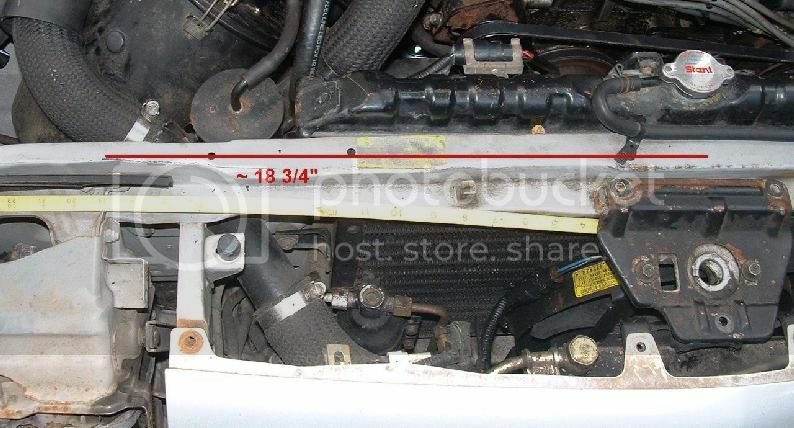 If you still have your A/C parts the red stick shows the approximate angle to use. Start underneath the black A/C canister, about 2" in front of the radiator. Go under the cable attached to the fan shroud, then along the top left edge of the fan shroud. 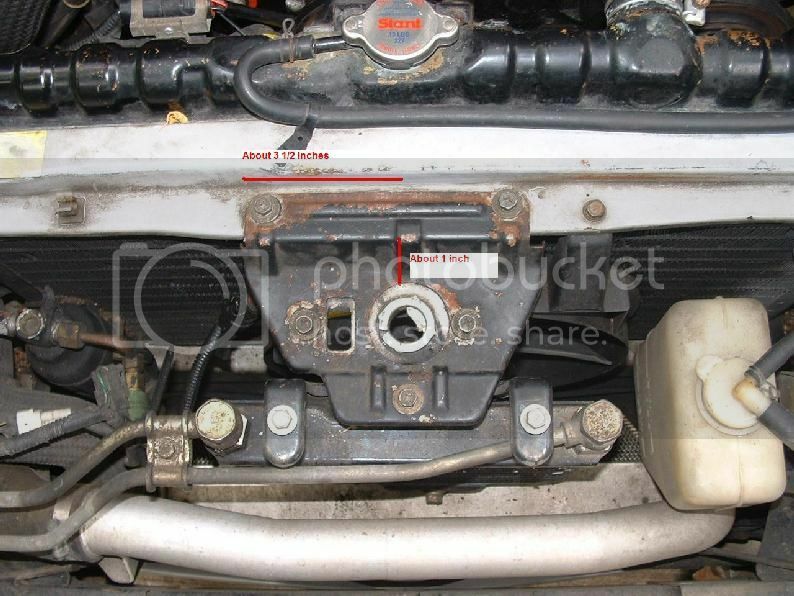 The top end of the tool should angle back to about 1" in front of the radiator at the latch. Another method mentioned is the headlight method. It appears you can run a tool under the hood approximately as shown by the red stick. It needs to angle down and then stick up to access the latch. If you have or can make a tool like this that is about 24" long you should be able to access the latch. Rotate the tip so it's horizontal, get it in position and rotate it so it's pointing up. It is about 18 3/4" from the edge of the headlight pivot to the latch, as shown. 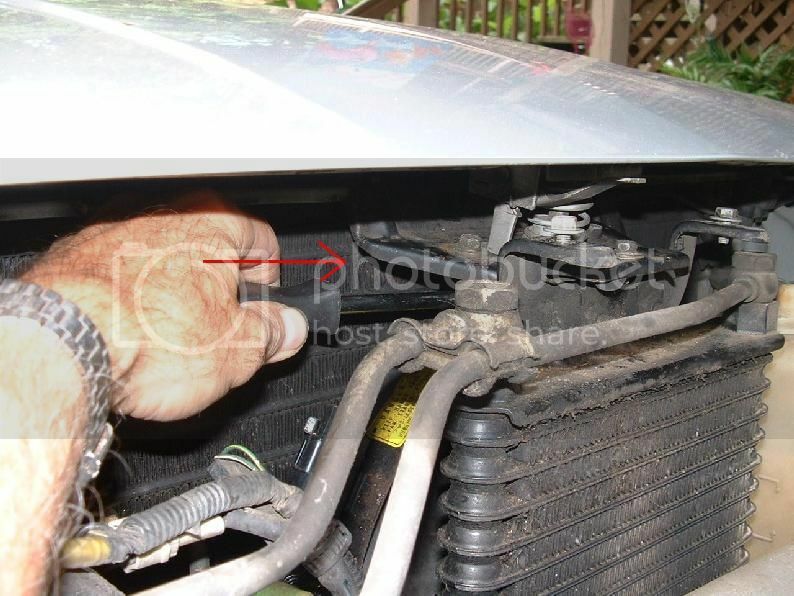 To get access from the headlight raise the headlights and remove the headlight surround. 5 phillips head screws (3 & 2). Driver's side headlight shown - Passenger side headlight required. 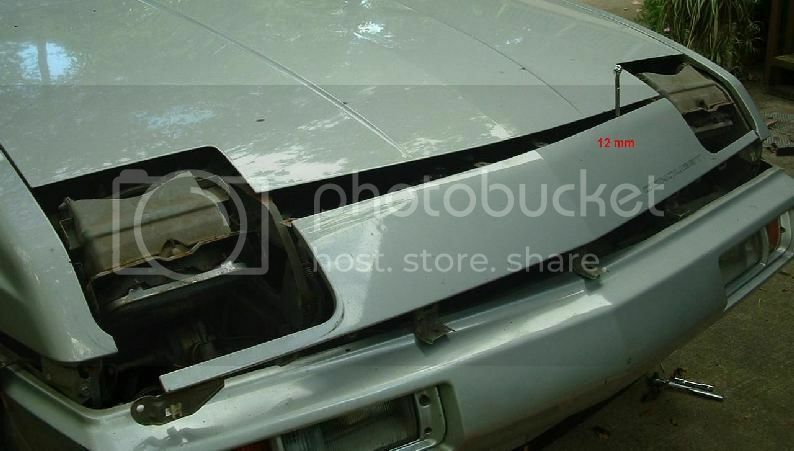 Remove the headlight body panel. 4 - 8mm/phillips head screws. Driver's side headlight shown - Passenger side headlight required. Again, removing the grill may be helpful if you have a helper. The final method I know of (and the one I used) is the headliner method. I didn't know that's what it's called. It's the body piece between the grill and the hood. 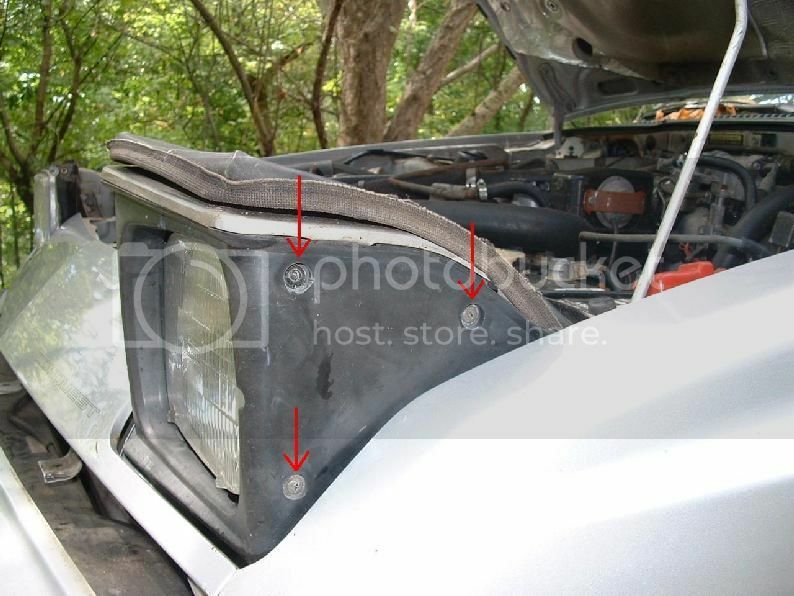 For the headliner method remove the grill and take the corner marker lights loose - 1 phillips head screw in each corner light, just leave the light assembles hanging. 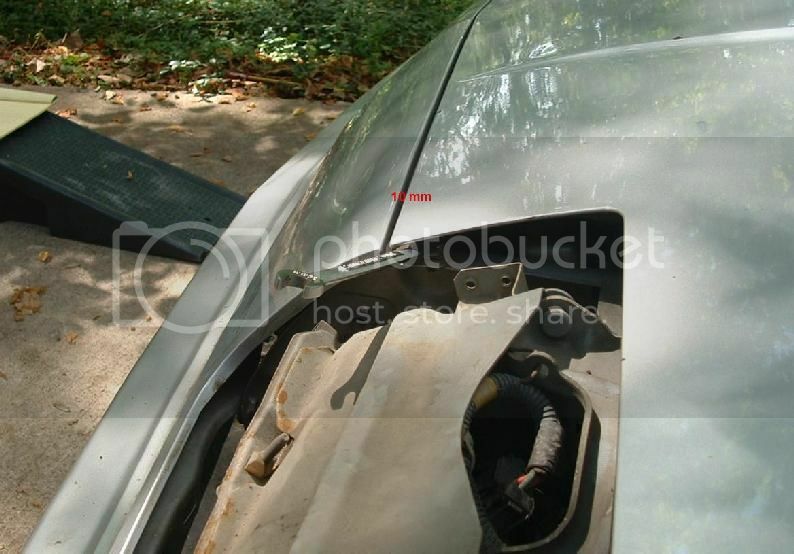 Raise the headlights and remove the headlight surrounds and headlight body panels as shown above. The headliner bolts are shown. 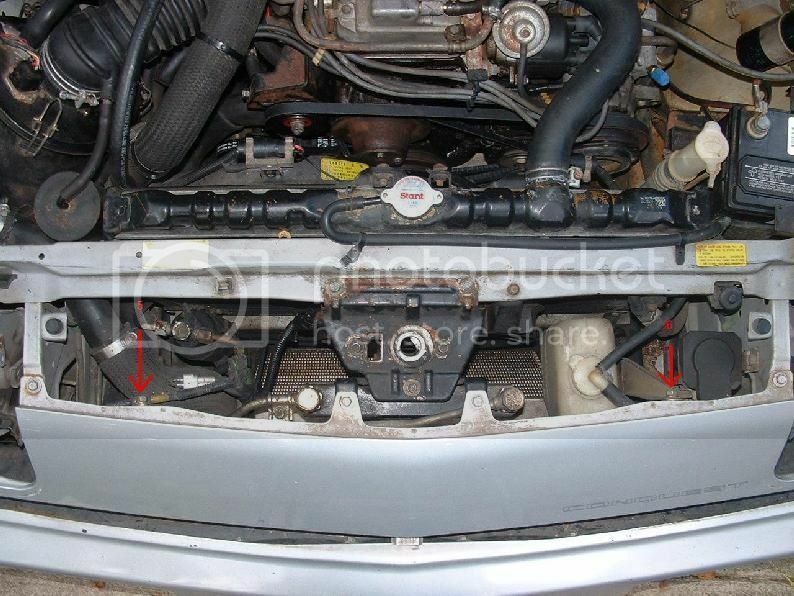 The 4 lower bolts can be accessed with the grill removed. 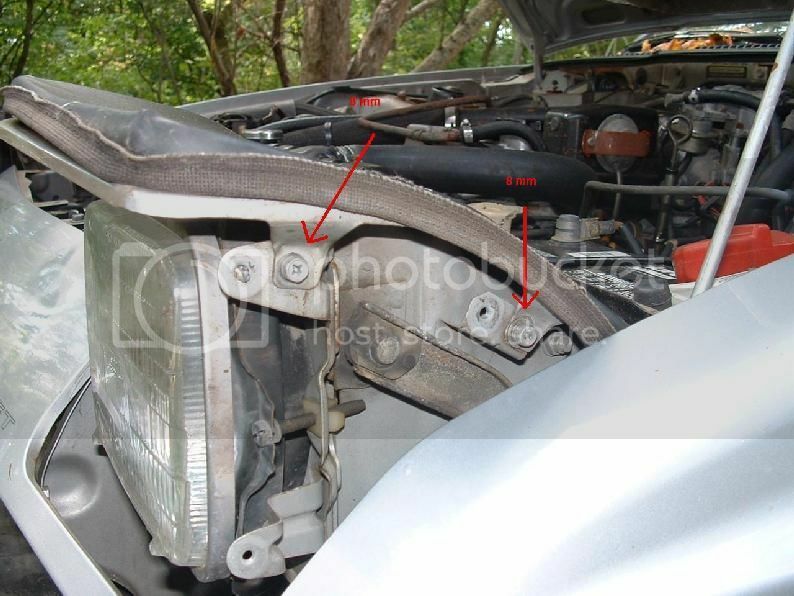 The right and left upper outside bolts can be accessed from next to the headlights. There is room to use the box end (recommended) of a 10mm wrench to start the bolt then you can switch to the open end if desired. A wood wedge can be used to get enough clearance to access the 2 upper center bolts. 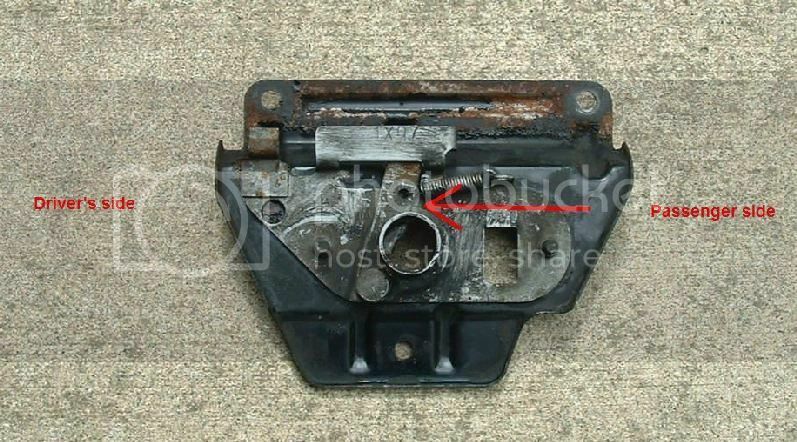 Again, use the box end to start the bolts (recommended) and switch to the open end if desired. There are 2 more 12mm bolts as shown. The bolt on the left holds a wiring harness clip. With the 8 smaller bolts removed, the left side of the headliner can be pulled forward to access the left hand bolt. The right hand bolt attaches to 2 brackets and is not as flexible. Pulling the left side of the headliner out as far as possible (without damaging it) will provide just enough room to fit the open end of a 12mm wrench on the bolt. There is only room to turn about 1/2 flat at a time until the bolt has been loosened a bit. Then there will be more room to turn the wrench. 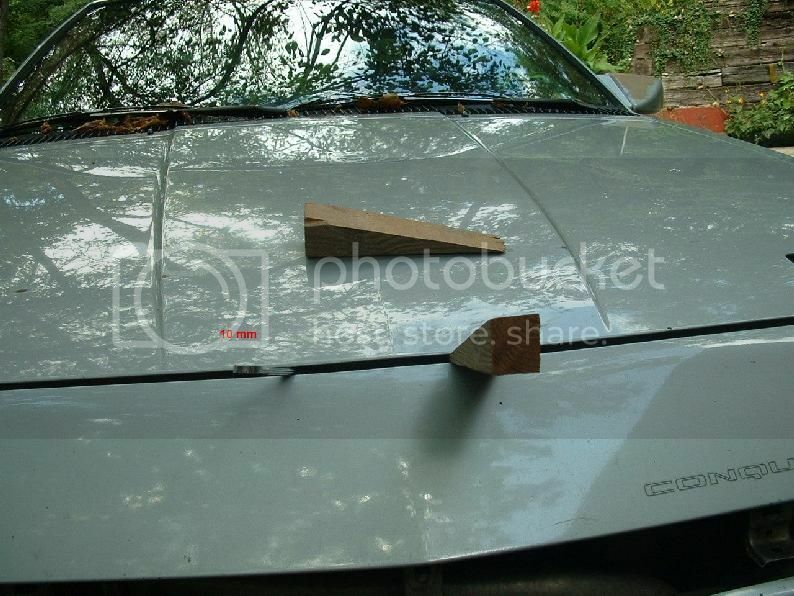 It might be a good idea to place something protective between the wrench and the front edge of the hood to keep from scraping the paint. It is now easy to use a right angle pick or similar tool to release the latch. One link says you can get bicycle brake cable and run it through the existing housing. Attach suitable (set screw) cable ends. Another link says you can tape the new cable to the old cable, end to end, and pull them through. This made me really nervous because of the blind area between the firewall and the fender well, so I did it the hard way. The cable enters the interior at the extreme upper left hand corner of the firewall under the dashboard. 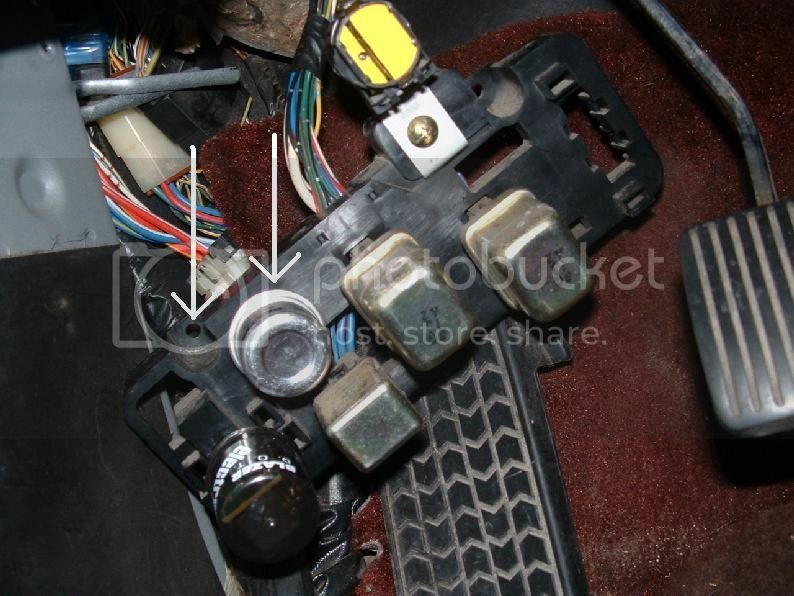 To access this, remove the lower dashboard panel - 3 phillips head screws bottom center, 2 phillips head visible trim screws, 1 hidden phillips head screw behind the blank plug (carefully pry out plug with a small screwdriver) and 1 hidden phillips head screw behind the 'int rear wiper cancel' button (pull button off, unscrew chrome ring, push switch out). Unbolt the relay panel. The bottom (phillips head trim) screw is easily visible. The arrow points to the top screw location. The (round) relay next to it may have to be unplugged to gain access. Also remove the kick panel (if necessary). 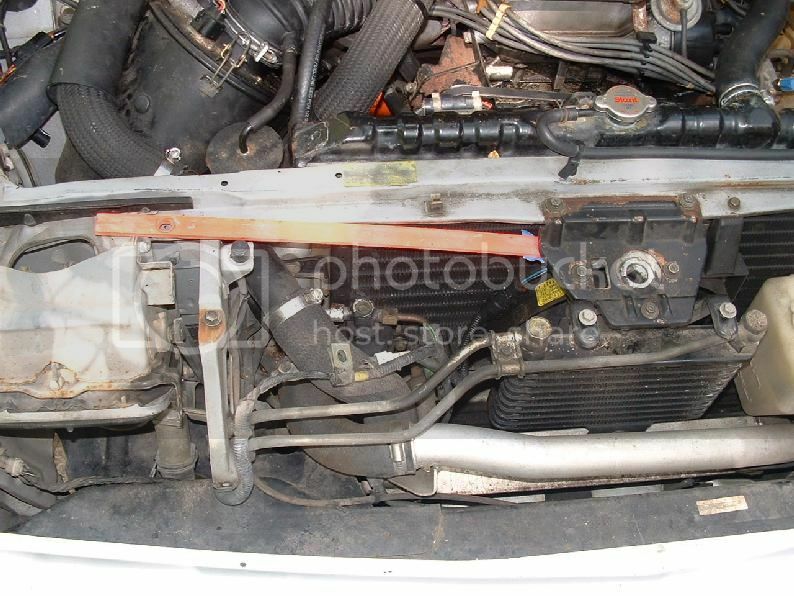 This is a somewhat blurry view of the grommet where the wire harness and hood release cable go through the firewall. 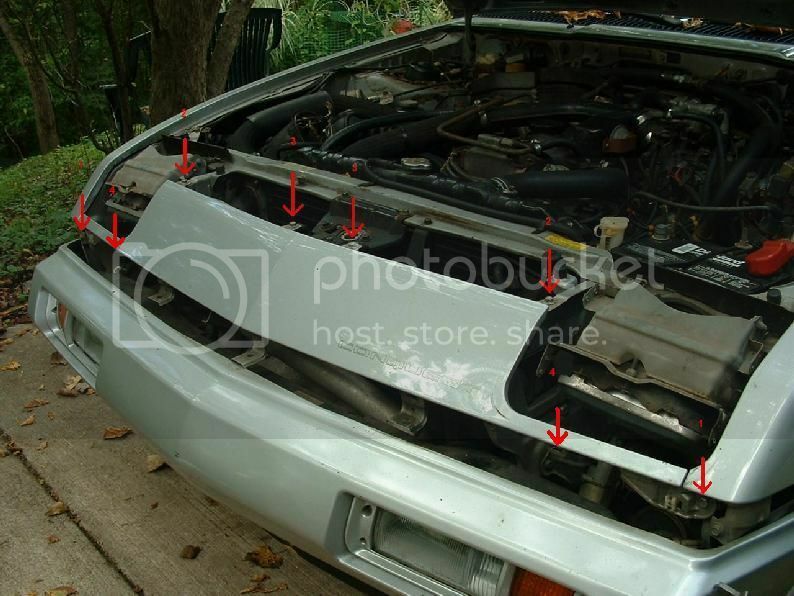 The arrows point to the hood release cable and the shaky line is supposed to delineate the wire harness. There seems to be a hard plastic cylinder molded into the grommet where the harness goes through. 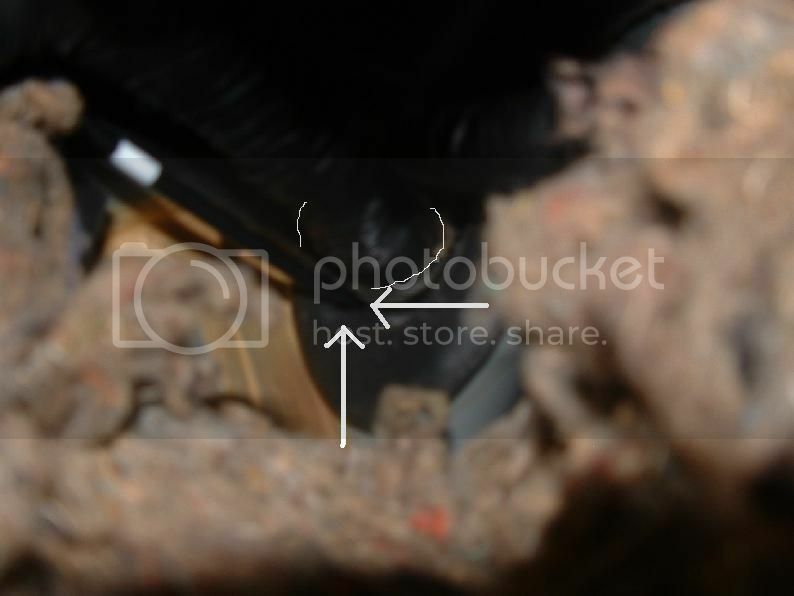 Below that, there seems to be a hole molded into the rubber where the hood release cable goes through. I taped the new cable alongside the old cable due to my fear of them becoming separated in the blind area between the firewall and the fender well. This meant the new cable wasn't going to make it through the molded hole. I did a bit of a hatchet job and used a utility knife to cut a slit in the grommet, out from the molded hole, below the wire harness. This provided room to pull the cable assembly through and the slit closed back up when I was finished. Hope this helps somebody in the future. Trying to pay forward the help I've received from the forums so far. Edited by Greg23, 10 September 2013 - 05:16 PM. Interests:Music, Movies, Guitars, Family, Computers and Starquests!!! Wow, nice write-up Dude... This should help out a bunch of members. Way to go on the pics! Nice write-up. I'll move it to a FAQ forum.